Question: I have been fortunate enough to fish backcountry rivers in New Zealand many times. The fish are very large, five to ten pounds on average, and it’s all sight-fishing. Normally, a well-presented large dry fly, like a Cicada, fools the fish and the fun begins. However, sometimes four or five different flies—each presented well several times—produces no strikes. Then, my guide puts on a large nymph as a dropper. My question to the experts is this: Why, about 50% of the time, does the fish then immediately strike the same unsuccessful dry fly, instead of the nymph? We have bandied this around on the streams. Any thoughts? Carl’s Cicada by Carl “Boomer” Stout of Trout Creek Flies on the Green River. Photo courtesy of Umpqua Feather Merchants. Tom Rosenbauer, author ofThe Orvis Guide to Fly Fishingand host of the podcast of the same name: The sound of the nymph plopping into the water, combined with a big dry fly landing, attracts the fish to what seems like a sudden increase in food. Cicadas are such a high-calorie meal that even large trout will move a long distance and compete for them (unlike most of the food they eat). Brian O’Keefe, well-known angler and photographer, and editor of Catchonline magazine: I am stumped. My guess is that the drag from the nymph is causing a slightly different presentation of the dry fly. Maybe it is causing the fly to ride or drift differently on the surface. I would be glad to do the research, if you send me a ticket! 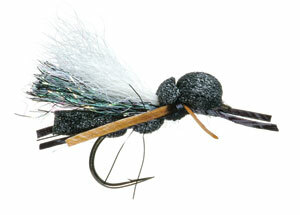 The additional time it takes to tie on a nymph dropper (slightly longer than it takes to change out the dry only). In essence, you are giving the fish a break. The nymph pulls the dry fly lower into the surface film, changing the appearance of the fly to the fish. Paul Schullery, angling historian and writer: I suppose the dropper, being affected differently by the current (if it is), could be giving the dry fly some sort of motion that makes it seem more active or alive or otherwise interesting. Or maybe the extra weight of the dropper is causing the leader to be delivered onto the water differently so the fly lands and floats in a different aspect than it otherwise might? Or it is just some bizarre coincidence with no discernible meaning, and we should all get a real hobby? All of these theories sound plausible to me, but there’s no way to determine who’s right. If we knew all the answers, fly fishing would get boring pretty quickly, though, don’t you think?